A 6 part telecall series on creating intimacy beyond the confines of this reality. Are you ready for you? The Elements of Intimacy: Creating intimacy beyond the confines of this reality. Have you ever wondered what it would take to create phenomenal relationships and true intimacy with others? If you have ever heard “you have to work on yourself first?” you may have found that phrase intensely irritating. Where do you begin with creating intimacy and honoring for yourself when you have no reference point for what true intimacy even is? 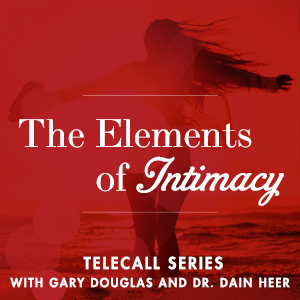 In this teleseries, The Elements of Intimacy, Gary Douglas and Dr Dain Heer will break down intimacy into the 5 concrete elements of honor, trust, vulnerability, allowance and gratitude, and give you pragmatic tools to begin choosing and creating true intimacy with yourself and others today. Join us in this uncharted territory for a look at creating intimacy beyond the confines of this reality. Are you ready for you?